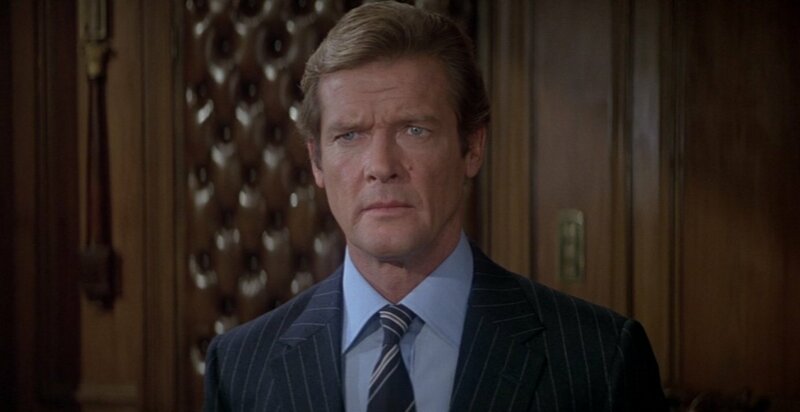 Roger Moore’s James Bond is the only one who wears striped ties. 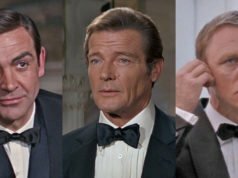 Until Moore became Bond, all of James Bond’s ties were solid. The only exception is the tie Bond wears as Sir Hilary Bray, but since it is Sir Hilary’s own tie and part of a disguise it don’t count. 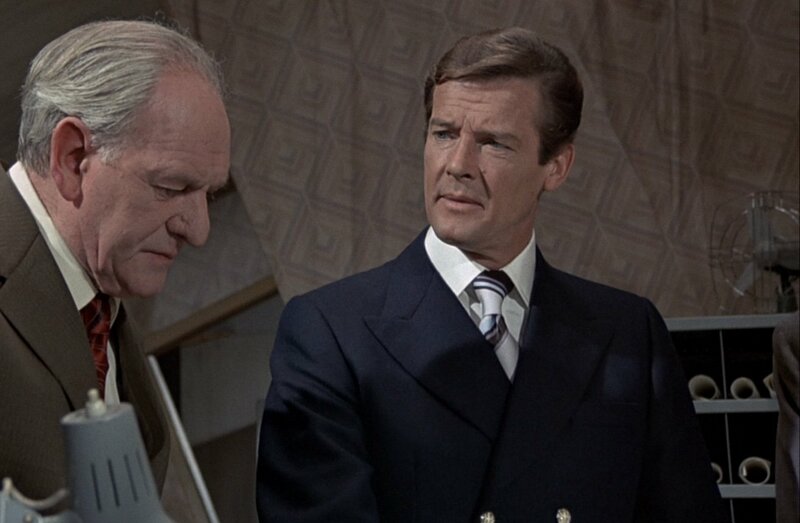 Bond’s own first non-solid tie of the series in Live and Let Die is quite appropriate since it’s a Royal Navy regimental stripe. Striped ties often come with an affiliation, and Q’s Brigade of Guards tie in From Russia With Love is another example of that. Regiments, colleges, universities, clubs and more have their own colours and stripe patterns, and only people who are affiliated with such ties should wear them. Regimental-striped ties are typically woven in a repp weave, and the stripes are woven, not printed. In almost all British striped ties the stripes go up from the wearer’s right to left. The ascending stripes help draw the eye upward, and they harmonise with the left-over-right buttoning of men’s clothing. American striped ties take British patterns and change the direction, descending from the wearer’s right to left. When the stripe direction is changed the tie’s affiliation is lost and anyone can rightfully wear it. Not all stripes have an affiliation. Moore’s brown-striped tie in The Spy Who Loved Me likely does not have an affiliation. The Italian striped ties in Moonraker, whilst following the American direction, are printed silk and have little in common with the regimental striped ties. 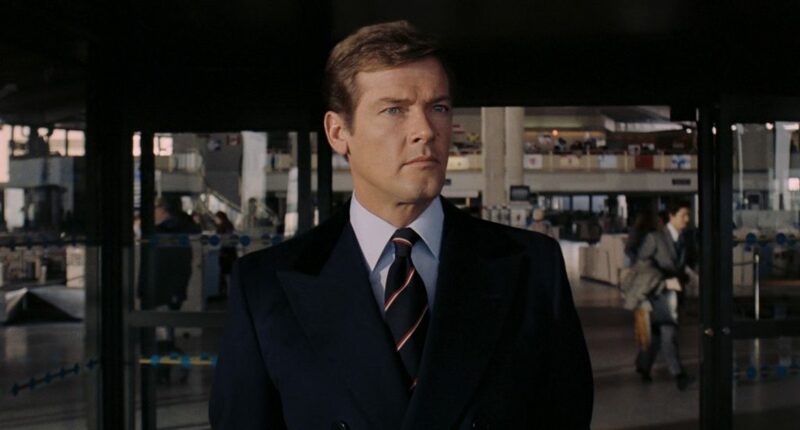 Moore also wears striped ties in The Man with the Golden Gun (with his navy blazer, picture above) and in For Your Eyes Only (with his navy chalkstripe suit, pictured below). These ties may have an affiliation, but I am unaware of what they may be. If anyone knows what those ties represent, please comment below. It’s interesting to me how this is an aspect of men’s dress that has really changed. I recall striped ties being worn by almost everyone in the 80s (at least where I lived at the time) and it seeming to be the default choice for ties. These days, although I see them for sale in department stores, I rarely see anyone wear them. I wonder if these are still common in places where more “traditional” styles are still worn? As I said in a previous thread, I never see people wear the navy blazer/grey pants combo (at least in the financial district in Toronto) yet that look is apparently still very popular elsewhere. I don’t see striped ties too often. The navy blazer and grey trousers combo is still very popular in New York. I can certainly understand Moore’s desire to make Bond more contemporary to his era and not appear to be a relic from the 60’s as well as break away from the Connery image and make Bond his own. With all due respect to Sir Roger, solid color ties just say Bond to me. I’m not a fan of the stripes. The navy tie with red and white stripe is the tie indicating service in the Royal Navy. The gray trouser/ blue sportcoat look has gone out of style as it worn by ervery security gaurd and limo driver. Mason really looks excellent there. Perhaps one way to avoid the “security guard” look is by wearing trousers with a subtle pattern, as Mason demonstrates here. Although I don’t see anything wrong with a plain mid or light grey either. I disagree, I think that’s a very poor example of the classic navy blazer and grey trousers. First, it looks boring – the tie (for all that it could be a grenadine with surface texture) is almost the exact same colour as the jacket. The contrast collar shirt is so pale blue there’s barely any contrast, and the shoes have no cap, broguing or any other features to break up that vast expanse of leather from the throat to the toe. The only interest is the subtle windowpane in the trousers. Next the fit – the tie knot is too small for the length of the collar (Connery too was guilty of this in the early films), e tie looks too slim in comparison to the width of the lapels, and the jacket skirts look to be very long (especially by today’s less than traditional standards) which isn’t helped by a slouchy stance with hands in pockets. Trousers look roomy too but again this could be the stance. Mr. Mason looks comfortable and relaxed in his clothes, which in turn look ‘lived in’, but if he was standing outside his shop as an advert for his tailoring skills I’d be inclined to keep on walking! Well, I actually kind of like the monotone look. And I like the shoes very much as well. I’m guessing they’re derby shoes with two or three eyelets. I’ve been looking for an affordable pair for some time now. But as you said, horses for courses. One thing I just noticed is that the tie does look rather slim compared to the lapel. What do you think about this, Matt? I personally think the narrow tie (3 1/4″) works very well with the wider lapels. It’s a 1930’s way of wearing wide lapels, and it doesn’t give the outfit a 70’s look. Lapel width and tie width don’t necessarily have to match, but I find that a wide tie with narrow lapels doesn’t work nearly as well as the reverse. Now think how that could be improved, with a bolder stripe in the shirt, some colour in the tie besides navy, a complimentary pocket square, and shoes in burgundy or chilli, or snuff suede, with a toecap or brogue or even e dreaded double monkstrap. Obviously he’s going for a sedate, almost monotone look, but I’d prefer to see a bit more character to move it away from accusations of security guard while maintaining some of the blazer-and-flannels tradition. Having seen Mr Mason walking down Regent Street in a “Goldfinger” suit I have to confess that he has a natural style that most people will never get close to. Sometimes it’s not the clothes (nice though they are! )but the man who wears them. That is the risk inherent to such patterns. I had the upper hand by replying that I this was regrettably impossible, due to the stripes’s deliberately different direction. This made the audience laugh -including my officer colleague- where they had previously just smiled. Sam Hober produces wonderful ties, with both British and American directions. I wear striped ties (but then I’m a dinosaur who’s sartorial influence is a Bond from 30 years ago!). Who cares? Seriously though, they seem to wax and wane in popularity but I think they provide a nice variation in one’s wardrobe. For me, I have quite a few and they work particularly well with blazers and well with suits. 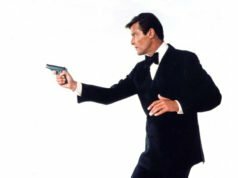 I think Sir Roger’s Bond brought a bit of variety and colour to the character’s wardrobe and apart from stripes we saw grenadine and shantung silk and some others with geometric, abstract and motif patterns. Much more interesting than the same old dark knitted tie but of course that’s subjective. The navy blazer look can be boring but only, as Matt suggests, if it’s executed by someone who has no innate flair. It can depend on the shade of grey trouser. Perhaps a light grey or charcoal flannel (like Connery wore) are a little more inspired than mid grey which could come across as a tad boring. Then what about the same blazer with beige or stone colour trousers, a great look for the Spring or Summer seasons even if, as I acknowledge, a little old hat now. Who cares? Agree totally with all your comments. I’m another dinosaur. I’ve read somewhere that the reason the British regimental stripes is from the upper left is because it symbolizes the the heart (left chest). Anyway, ever since I learned of the direction of the stripes, I just can’t stop wondering whenever I see someone wearing a regimental tie if he actually belongs to that regiment. A well-dressed man in a navy jacket and grey trousers has no risk of being mistaken for a limo driver or security guard in Los Angeles. All the local limo drivers and the majority of security personnel wear ill-fitting black suits. I *only* wear striped ties and have quite the collection of fat to skinny, although not working in an office anymore I rarely wear them. I would wear my vintage bought fat seventies runway stripers with jeans on Fridays and call it Fat Tie Friday. I really liked Larry Hagman as JR Ewing’s striped ties in Dallas and decided one day from that day forward, I would only wear a striped tie. Now, I must tell you, it’s a real time saver. You go to the tie section and you can discard everything else and only focus on one style. I will say, I’ve seen a resurgence of the striped tie in my casual observation because of Mad Men and the skinny stripers worn on the show. I agree, striped ties are quite rare these days. I work in the City of London and seem to be one of the few people appreciating the look. I wear regimental ties but never got into an awkward situation. Recently I watched a Bill Clinton speach from 1993. He wore a striped tie which really struck me given that politicians these days seem to have agreed on solid pale blue ties as their uniform. Strongly agree w/positive views of Moore’s striped ties. It’s a pity that this tie is so often found on the salesman/politico straining for a “trust me” vibe. In Australia, yacht clubs and military bodies, etc., often add a symbol or crest to their ties to show that it is not a generic striped tie. Not sure how well stripes would fare on the narrow ties Craig will prob. be wearing in future film(s).